Hawthorn Imaging Services include digital mammography, MRI and CT scanning, nuclear medicine, and x-ray services. Hawthorn Medical Diagnostic Imaging is the first in the Southcoast area to offer patients the latest 3D technology for clinically superior mammograms with exceptionally sharp images. 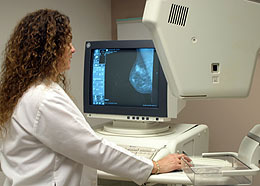 To schedule an appointment for 3D Mammography, call 508-961-0855. For patient convenience, Hawthorn’s mammography department is open on Wednesday and Thursday evenings, and Saturdays from 8:00 am–4:00 pm. MRI (Magnetic Resonance Imaging) creates cross-section photos without radiation. Instead, the images are produced by using powerful, but painless magnetic field and radio frequency waves. The images are able to show organs, muscles, ligaments, tendons, bones and other structures with greater clarity. In the fall of 2016, Hawthorn installed a new GE Optima MRI unit that offers advanced scanning capabilities while emphasizing patient comfort. The unit features a wide bore (opening) diameter and feet-first imaging, which will help patients who often feel claustrophobic. In addition, the unit has acoustic reduction technology and a special video screen for patients to watch during the scan with their choice of scenery and music. CT Scan (computed tomography) combines the use of computers and x-rays to obtain specialized images. While lying on a table, an x-ray “tube” moves around the area to be scanned. Multiple images are made at different angles to create a cross-section photo. 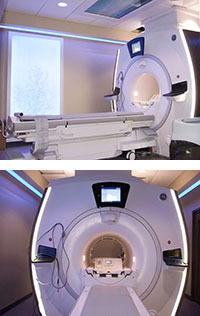 Both the CT Department and MRI are accredited by the American College of Radiology (ACR). The ACR awards accreditation to facilities for the achievement of high practice standards determined by a peer-review evaluation of the facility and its practices. Hawthorn Medical’s nuclear medicine services are performed by highly trained specialists and involve the use of small amounts of radioactive materials (tracers). Nuclear medicine is different from other diagnostic imaging tests because it determines the cause of a medical problem based on function instead of structure. A special camera that detects the “tracer” is used to take pictures and record the information. The Nuclear Medicine and Nuclear Cardiology Laboratories have been awarded accreditation by the Intersocietal Commission for the Accreditation of Nuclear Medicine Laboratories (ICANL). Ultrasound uses sound waves to painlessly create images of internal structures. The sound is reflected off internal soft-tissue organs and analyzed by a computer. The Ultrasound Department has been awarded accreditation by the American College of Radiology (ACR). The ACR awards accreditation to facilities for the achievement of high practice standards determined by a peer-review evaluation of the facility and its practices. Hawthorn Medical uses digital technology to improve the care we provide to our patients. X-ray studies are taken digitally and stored on a Picture Archival and Communication System (PACS), designed for transmission, display and storage of images within a secure internet site. This technology assists radiologists in completing reports and having them available to other physicians more quickly, and allows physicians to view images from any location.